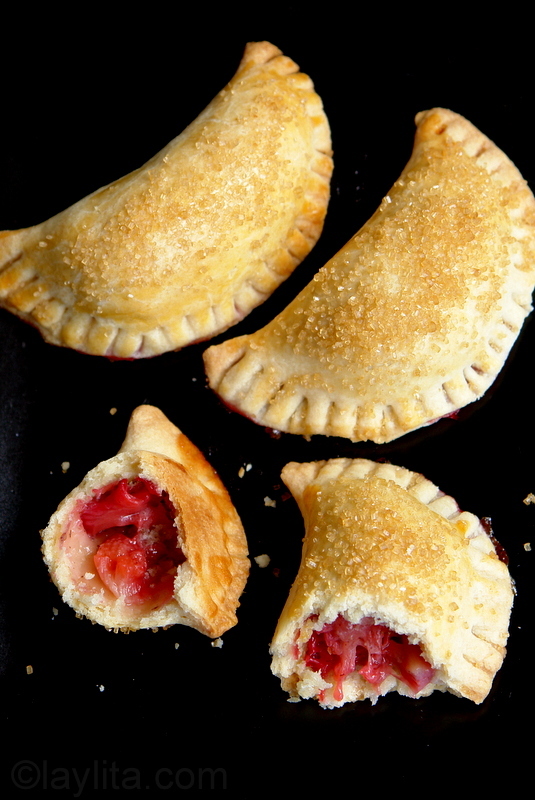 These rhubarb and strawberry empanadas or sweet turnovers are perfect to celebrate spring (and summer). It’s probably pretty obvious by now that I really like empanadas, and most of the time I make savory empanadas. As a kid I obviously preferred the sweet empanadas stuffed with yummy fruit inside, so every now and then I want a sweet empanada either for dessert or breakfast or as an afternoon snack with some café con leche. I’m also trying to incorporate all the yummy things I get at the farmer’s market into my cooking, so while the original plan was to use strawberries as the filling when I saw the bright red stalks of rhubarb I had to add them -partly out of curiosity because I have heard all about how strawberries and rhubarb make this great combination, but had never tasted it before. 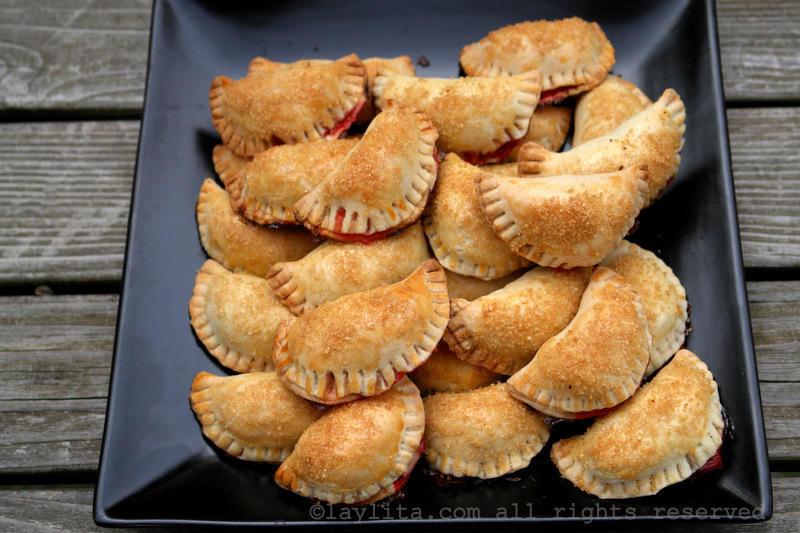 Easy recipe for homemade rhubarb and strawberry empanadas. These sweet dessert empanadas or turnovers are filled with rhubarb and strawberry, baked, and served with whipped cream. 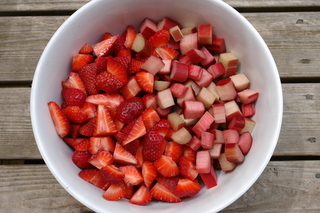 Combine the rhubarb, strawberries, sugar, orange juice and cornstarch in a large bowl, mix well and let rest for an hour. 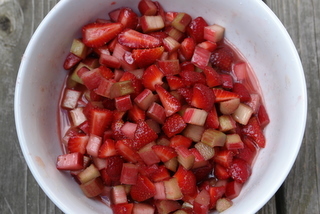 Drain the liquid from the strawberries and rhubarb. 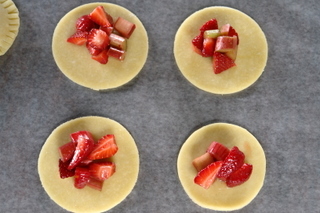 To assemble the empanadas spoon the rhubarb and strawberry mixture on the center of the empanada disc. Brush the edges of the empanada disc with the egg whites. Fold the empanada discs and seal the edges, use a fork to help seal the empanadas. 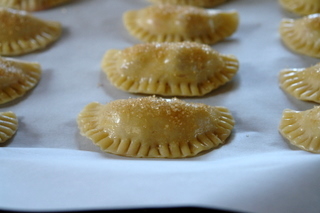 Lightly brush the top of the empanadas with the egg yolk; this will give them a nice golden glow when baked. Sprinkle the demerara sugar on the top of the empanadas. Chill the empanadas for at least 30 minutes, this will help them seal better and prevent leaks. 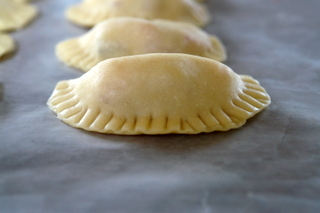 Bake the empanadas in a pre-heated oven at 375 F for 30 minutes or until golden. Serve either warm or cold with whipped cream. Of course the first thing I did when I got home was try a piece of rhubarb, yuck, so sour, though it reminded me of a small plant that used to grow close the water canals on our farm in Ecuador. This plant had small and very thin green reddish stalks that I don’t how or why but I tasted them and they were very sour, yet almost refreshing, but essentially still tasted like something a normal person wouldn’t eat. I was skeptical but if “everyone” thought rhubarb, strawberries and sugar were great then I had to try it, so I chopped a few more pieces of rhubarb, added some chopped strawberries, sugar and cooked it for a few minutes, and it actually tasted quite good. At first I was going to cook the rhubarb and strawberries to make the filling, but when I did my little taste test I noticed how quickly they both cooked, which meant that just the heat of the oven while they were baking would be sufficient, so I just mixed them with sugar, orange juice and cornstarch and let them marinate for an hour. I drained the rhubarb and strawberry mixture to remove as much liquid as possible, because I didn’t want it leaking out, however despite that and despite trying to seal the empanadas they still leaked while they were baking. I’ve gotten a lot better at keeping cheese from leaking from empanadas, but need to work on the fruit ones. 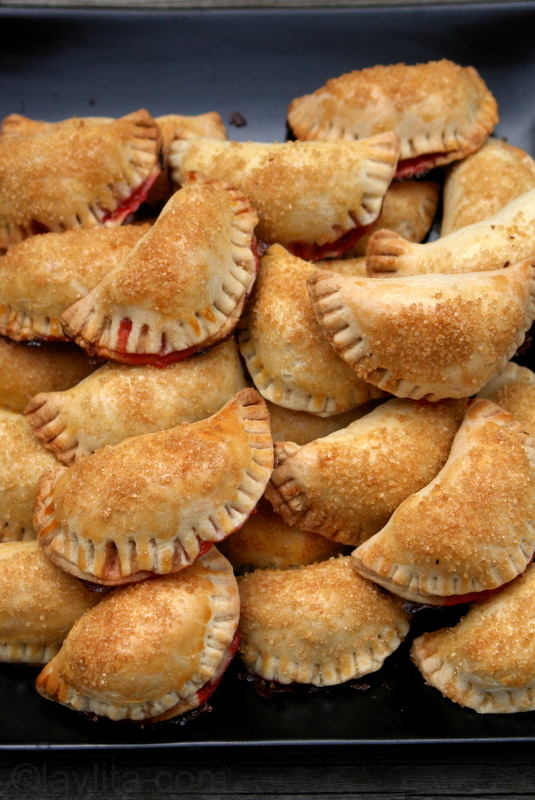 Though it is not really a big deal if fruit empanadas leak when baking, usually it is just the juices that leak out – and they leave a nice color on the edges, plus the empanadas still taste great. 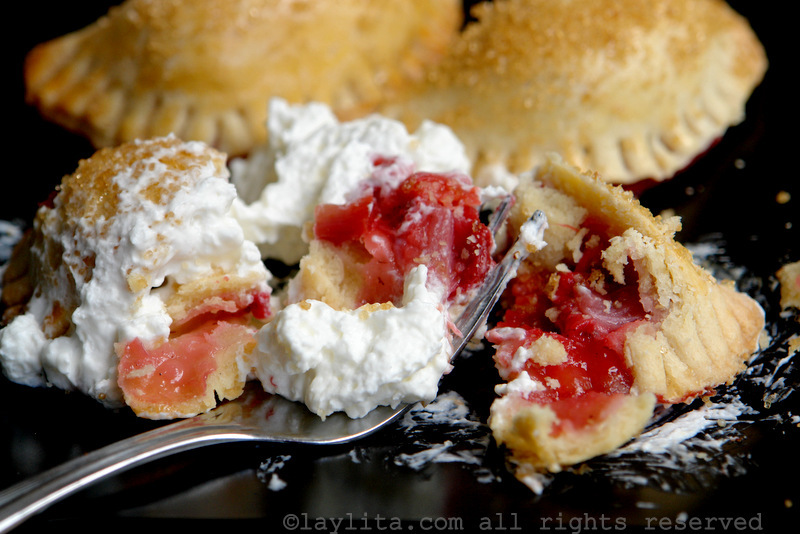 I served these strawberry and rhubarb empanadas with some Grand Marnier (orange liqueur) whipped cream, I have one of those cool cream whippers where you just mix all the ingredients and then put them in the whipper container, charge it and done. I used 2 cups of heavy cream, 3 tbs of sugar and 2 tbs of Grand Marnier, and it was just right, not too sweet and with a hint of orange liqueur. What a nice recipe, I love the ingredients put together! I am going to try and make them with blueberries and rhubarb and add some chocolate pieces and see what happens. What I want to know is, can these be frozen before or after baking. I live in Ecuador and am wondering if I can find rhubarb here? If not, what’s the similar vegetable you had as a kid? Could I substitute it for rhubarb? Hi Clara – It isn’t common in Ecuador, you won’t find it at the markets, but you might check at one of the viveros (plant farms) to see if they can get it for you. Or if you can have someone in the US send you seeds you can grow it there. It’s called ruibarbo in Spanish. The plant (can’t remember the name) that I had as a kid had very thin stalks, that wouldn’t work as a substitute. Just had to say thank you for this recipe! These are so yummy and my family, friends and coworkers went nuts over them. Next time you make them, I would recommend using more rhubarb than strawberries (I’d say twice as much rhubarb), because the reason Americans use rhubarb is to cut down on the amount of fruit that they’re using. Is it possible for me to bake them at 400 F for 15-20 minutes? Hi Cathy – Baking temps/times tend to be different depending on the oven, so if you know that 400F works well for your oven when making pastries, then you can try it at 400F and just keep an eye on them. It also depends on the size of the empanadas, if you’re making them medium or slightly larger it will likely be fine, but with the smaller ones I would recommend watching them closely to make sure they don’t burn. Where did you get your whipping cream thing??? These look wonderful. Will try them VERY soon. These looks absolutely adorable and I would like a bite of them…just about now! thankyou so much for this delicious recipie! I just did it yesterday and it was fantastic! my whole family loved it so much! i had a craving for sweet homemade empandas and when i read this it literally answered my crave!!! THEY WERE SWEET and DELICIOUS not to mention your dough recipie is fantastic! right now we still have rhubarb in season, but strawberries are on their way out. 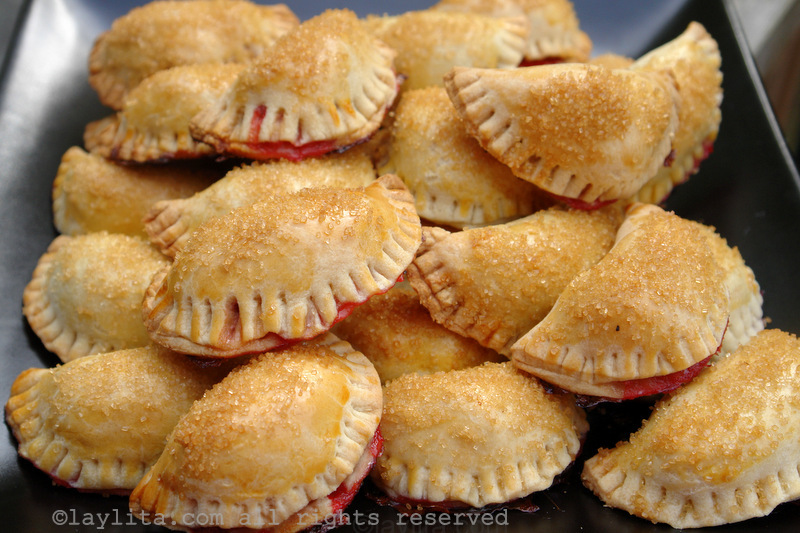 i bet it would be nice to try the rhubarb empanadas with raspberries to replace the dwindling strawberries. also, for plants with a little longer duration, possibly early blueberries & rhubarb. i made a rhubarb cake tonight with wild black raspberry /cream cheese frosting. the two were perfect together as the cake was tart and the frosting was moderately sweet. i have some rhubarb left over, so i’m going to try to make these. also, i wonder if the plant you knew in ecuador was burdock. it looks a lot like rhubarb but is darker overall. i don’t know if they taste similar or not. Another great idea! I made these last night and to prevent the fruit from getting too juicy and spilling out I added a tablespoon of arrowroot powder to the filling (instead of cornstarch). First, mix the arrowroot with the sugar, then add it to the fruit. This acts like a thickener without compromising the flavor like cornstarch. Either way- the recipe is a keeper. The empanadas look great. 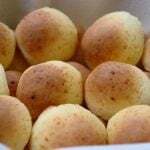 I was just talking to my mom yesterday about when I was younger helping my grandmother in the kitchen making them. She would make sweet ones like the one’s above and some fashioned like a meal such as meat and potato or chorizo and potato. The sweet ones were great too. Your empanadas look great. WOW they look so sweet and yummy . I can’t wait to git em a try ! I’ve never seen sweet empanadas before, only savoury ones – they look and sound delicous though, will try your recipe very soon – thanks for sharing! Very good job! That would be a great recipe to use for my annual summer party. Nice and portable. Ahh… what a great idea! I bet they are delicious! You have me craving them right now!!! i did your empanadas for my spanish project. they turned out GREAT. there even better than my family’s home made empanadas. Those are FABULOUS! I made something similar that was supposed to be a take on Hostess fruite pies. Mine don’t look anywhere NEAR as cute as yours. They are perfectly shaped. Those look like little parcels of goodness! Can just imagine biting into one and getting that burst of flavour that would come out of them! Haven’t seen many recipes with strawberries and rhubard mixed together but I can imagine that it works pretty well! These look sopretty! I have never made anything with rhubarb, though I remember my dad loving rhubarb pie! Hi! I made these today, my first time making empanadas. It was a success, and I’ll take it as a sign of special victory that I only had a little bit more leakage than you. Mine aren’t quite as regularly shaped, but overall, they turned out well, and weren’t too hard to do. Thanks for the great recipe and easy instructions! Hi Kells – I’m glad these worked out for you, mine didn’t look so good the first time I made them, it’s all about practice. Also, on these sweet ones they tend to look nicer and better shapped if you make them smaller than larger. These look so yummy! Thanks for posting the recipe along with the great pics. These i have to try ! it looks delicious. Impressive! These could make me change my stance on all things rhubarb. I love that you made empanadas. Very creative. I love empanadas and I have been looking through your blog for all your empanada posts. Thanks for sharing and will have to try my hand at these little pockets of heaven. Rhubarb is among the very few things I have never developed a taste for, but I can actually imagine liking it in this preparation. (Almost anything would taste good stuffed inside an empanada, no?!) It looks like the rhubarb you used was fairly young and tender, which is probably a good idea, too, especially without the step of precooking. A terrific recipe idea! And as always, your photography is lovely. These are, in a word, amazing. Thanks so much for this recipe- I’ll be using it often! One suggestion, add tapioca to the fruit mixture. When the empanadas cook the juices will be absorbed by the tapioca. Use the kind you have to cook, not the instant kind. I tried making sweet empanadas once. It was sort of a disaster. Your empanadas look terrific and inspiring to make. Wow they look amazingly yummy! Two of my favourite fruits – and I’ve started growing my own rhubarb too! Very cool photography and nicely detailed recipes. I don’t do desserts, but your blog is making me change my mind. This is the next thing I will have to make. I have no choice any more, they look absolutely delicious. oh wow these look delicious! strawberry rhubarb pie is my absolute favorite, i’m going to have to give these a try. These look great! Love the first shot of rhubarb!! Those look fantastic! I wonder if adding cream cheese on the inside would be a good idea. These look awesome! great job. What a perfect post to stumble across on the first warm days of spring here in Minneapolis. These look fantastic! 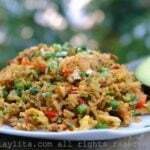 Thanks for sharing your recipes, your blog is great.